Quote: "In the last year I have gained a lot of Australian friends, Margot Robbie doesn't cry a lot... I've noticed that. I'm working with Joel Edgerton now. He told me he doesn't cry. Jai Courtney... I think it might be an (Aussie) thing." Will Smith has noticed his Australian co-stars don't really shed any tears. Fact: Newlywed Margot Robbie is preparing for her role as U.S. ice skater Tonya Harding in a new movie by hitting the ice at Pickwick Ice in Burbank, California - the rink where beloved U.S. TV star Alan Thicke was playing hockey when he suffered a fatal heart attack last month (Dec16). Margot's new movie, I, Tonya, chronicles Harding's bitter rivalry with fellow U.S. skater Nancy Kerrigan. Fact: Bindi Irwin, the daughter of late Crocodile Hunter Steve Irwin, has landed in the top 10 of Maxim magazine's Hot 100 poll of Australia's most beautiful women. The 18-year-old came in at number eight in her first year of eligibility. The 2016 list was topped by Margot Robbie, TV actress Jessica Marais and singer Delta Goodrem. Quote: "It just felt very epic and big and magical in some way. I haven't done a movie like that... Plus it was shooting in London, and I, on a whim, had just signed a lease on a house there." Margot Robbie admits her reasons for signing on to play Jane in director David Yates' new Tarzan film weren't all professional. Fact: Margot Robbie grew so close to the rat her Suicide Squad co-star Jared Leto gifted her that she decided to keep the rodent as a pet instead of killing him. Robbie tells Elle magazine that her character Harley Quinn would do the same, saying, "If Harley got something from Joker (played by Leto), she'd probably cherish it." Rat Rat now lives with the Australian actress in Los Angeles. Quote: "I was touching it the whole night but I didn't know it was worth that much when I went to the Oscars. I ran around and had a great time and got home the next day and everyone was like, 'You were wearing $1.5 million around your neck?' and I was like, 'Oh dear God, I was?'" Actress Margot Robbie had no idea how much the loaned Van Cleef & Arpels necklace she wore to the Academy Awards was worth until after the event. The jewellery was commissioned for the Duchess of Windsor in Britain in 1938. 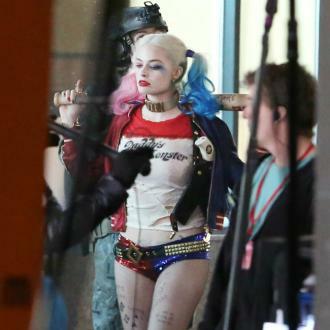 Quote: "Margot Robbie, when we started shooting the film, she was 23. I was 46! So Jada and I were sitting around and we found out that Margot got cast and Jada pulled up pictures of Margot online and she said, 'Boy, you need to go to the gym right now!' So I started training immediately. I used to be able to pop in shape, it doesn't pop - other things pop now!" Actor Will Smith had to train hard to look good opposite his Focus co-star Margot Robbie. Fact: Actors Danny Devito, Michael J. Fox and Australian beauty Margot Robbie were among the stars who turned out to cheer on the New York Rangers ice hockey team as they beat the Philadelphia Flyers 2-0 at Madison Square Garden on Wednesday (19Nov14). Quote: "In my big group of girlfriends back home, I am definitely not the best-looking. I did not grow up feeling like I was particularly attractive." The Wolf Of Wall Street beauty Margot Robbie insists her stunning looks are nothing special. Fact: Australian actress Margot Robbie is a big hit with her former employers at sandwich giant Subway - they have sent her a free sweater to thank her for mentioning the firm in interviews. Quote: "I recently read comments criticising me and my body. You start thinking, 'Why am I doing this?' Then I get calls from my grandparents telling me how proud they are. Then I know why I'm doing this." Australian actress Margot Robbie on the downsides of fame. Fact: Actress Margot Robbie once ate 3.9 pounds (1.8 kilograms) of spaghetti bolognese in an hour to win an eating competition bet with a crewmember on the set of Australian Tv show Neighbours. She says, "I was on the ground and I couldn't move... The (set) nurse gave me whatever they give toddlers when they drink poison... and I spewed up (vomited)." Fact: Australian actress Margot Robbie's plans for 2014 include learning to flag twirl, play the ukelele and travel to Iceland. Quote: "I really want to do a Western. I want to be the dude who is riding horses and doing exciting things - something where I get to do something physical and have to train for it." Australian actress Margot Robbie on her career goals. Quote: "There's something very likeable about him, even though he did terrible things... Everything he does is 10 steps further than everyone else does it, and that can seem exciting." Actress Margot Robbie on meeting disgraced Wall Street broker Jordan Belfort - the subject of her new movie The Wolf of Wall Street. Quote: "I'm still trying to convince (my family) that this is actually a career and not just a hobby, and that it's what I plan on doing with my life. They're slowly coming around to it." Australian actress Margot Robbie is determined to prove to her relatives that she can make it big in Hollywood after landing the role of Leonardo DiCaprio's wife in upcoming Martin Scorsese film The Wolf of Wall Street. Margot Robbie's Barbie movie partners with Mattel and Warner Bros.